How does art speak to us? How do we engage art? How does art engage us? These are three of many questions Laura Letinsky asks students in her visual art classes at the University of Chicago. A photographer interested in domesticity and the intimate sphere, Letinsky teaches both undergraduate- and graduate-level students. In Visual Language I, a core undergraduate class in the Visual Arts program, her students explore the visual and how this sensory field structures their relation to and understanding of the world. Letinsky finds that today’s student arrives more culturally and visually literate than students 10 to 15 years ago. 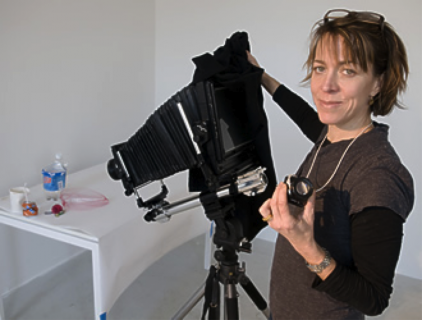 As a photographer, Letinsky offers students her own rich understanding of the visual world through her work and research. Letinsky says this is an exciting time to be an artist at the University of Chicago, particularly with the stimulation of planning for the Reva and David Logan Center for Creative and Performing Arts. It will be built on a site adjacent to Midway Studios—the current home of the Department of Visual Arts—on the University’s South Campus.